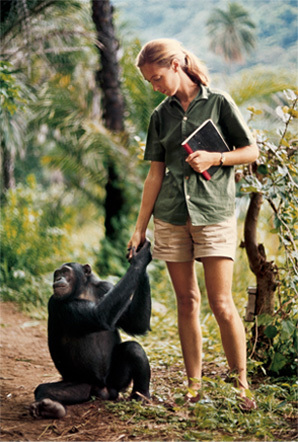 In July 1960, at the age of 26, Jane Goodall traveled with her mother to Gombe Stream National Park in what is now Tanzania and courageously entered the mysterious world of wild chimpanzees. She was equipped with little more than a notebook, binoculars, optimism and desire to learn more about these incredible animals. 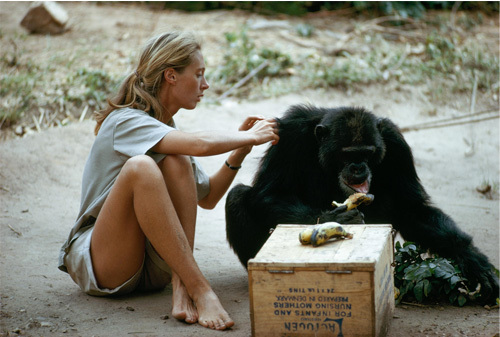 Through patience and persistence, she won the trust of the chimpanzees and eventually learnt more than anyone else on earth ever had about our closest living relatives. The public was fascinated by her findings, which changed the way that we look at evolution and ourselves forever. As a child living in England, Jane was given a life-like stuffed chimpanzee toy named Jubilee by her father. Her love for the toy sparked her early joy for animals. Today, Jubilee still sits on her dresser in London as a reminder of her desire to explore the unknown. Her love of living creatures was always apparent to everyone around her and since Tarzan was her favourite book, it was clear to a young Jane that this was her journey. However in the 1950’s, it was not an easy path to be a girl with a dream to explore, travel and be a scientist. Luckily Jane was determined and worked as a waitress until she had saved enough money for a ticket and off she went to explore the jungles of Africa. Today, Dr Jane’s work revolves around inspiring action on behalf of endangered species and encouraging people to do their part to make the world a better place for animals, people and our shared environment. The Jane Goodall Institute Australia works to protect the chimpanzees of Africa, their habitat and surrounding communities. We do this through community-centred conservation and sanctuaries in our Africa Programs and inspiring young people to make a difference in our Roots & Shoots program. Jane Goodall’s Roots & Shoots was started by Dr Jane and a group of students in Tanzania in 1991. Today Roots & Shoots has nearly 150,000 members in more than 140 countries.